One sinister sister took clowning around to a whole new level and gave her poor brother the fright of his life. And if you have a fear of clowns this video may not be for you! 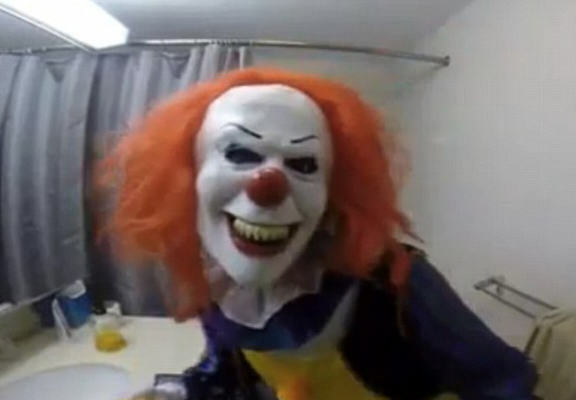 In the viral video, titled ‘Clown shares Jose’ and first shared on JukinVideo, the sister dresses as a scary clown and hides in the shower in wait for her sibling, while brandishing a butcher’s knife. Jose walks into the bathroom moments later and absolutely craps himself when he sees the horrifying figure greeting him. No doubt concerned he’s stepped into a real-life horror movie, he screams “Holy sh*t!” and absolutely legs it down the hall. His sister and his friends all get a big laugh out of the prank and, to be fair, Jose takes it in good spirits. You know, after he’s recovered from his near-heart attack!